As a researcher who has studied archives and interviewed participants in the air war of Israel’s War of Independence for nearly two decades, “Strange Bedfellows” (June 2007) naturally drew my attention on the magazine stand. Bob Haus’s article is riddled with errors and discredited information. Furthermore, it appears that he did no original work to create this article, but produced a compilation of information that he skimmed from other sources. On the first page, the article claims that shortages of fuel, parts, and mechanics kept the aircraft grounded. Fuel was not a concern, nor was parts, and the squadron functioned with imported Czechoslovakian mechanics as well as many native and volunteer ground crew. The reason the S-199s flew so little was because they kept crashing. The caption on p. 70 says that the (Israeli Air Force) museum S-199 carries the D.112 serial number. The S-199 at the museum is currently painted as D.120. The caption also says D.112 was the aircraft Modi Alon flew June 3, 1948. It was not, as D.112 had not yet entered service on that date. Alon probably flew D.105 or D.106. Similarly, the caption on the next page states that Baron Wiseberg crashed D.120 on June 4, but again, D.120 was not yet in service on that date. That statement is an error repeated from Cull/Aloni/Nicolle’s “Spitfires Over Israel”. It is true that the Jumo 211F could not produce as much power as the DB 605 series of the Bf 109G, but the two engines weighed about the same. The Jumo drove the massive VS 11 propeller that produced much more torque and P-factor (airflow twisting force) than the standard fighter propeller married to the DB 605. On p.73, Haus writes that the Israelis called the fighter the “Sakeen”. This is not so. No one called the the S-199 a “Sakeen” until decades later. The air force and its crews called it a Messerschmitt or Messer. 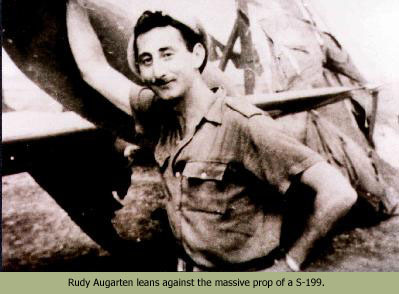 Also on that page is a photo of Rudy Augarten with “an Egyptian Spitfire he downed.” This is another error taken from other sources. A simple examination of the photograph shows that Augarten is leaning against the massive propeller of a S-199 with its wingtip behind him. You can see the 20mm cannon under Rudy’s right armpit. At the bottom of the page, the cutline shows 101 Squadron Spitfires “prior to battle”, but this photo was taken after hostilities ceased. 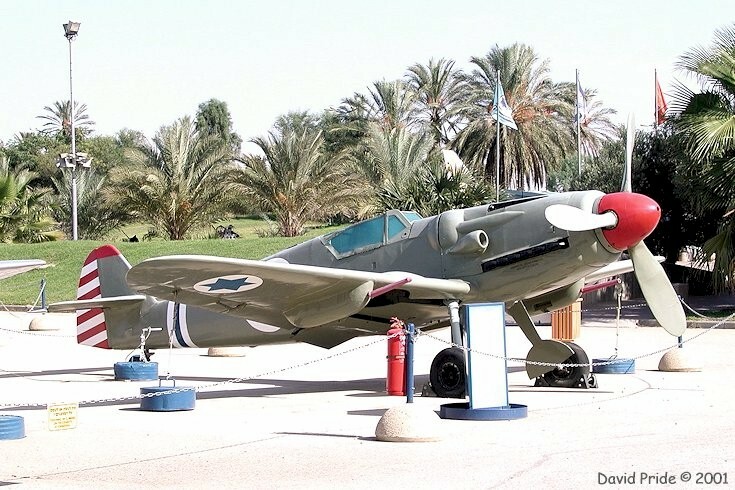 Spitfire 31 did not reach Israel until after the war. On p.74, Haus contends that Alon’s victories over the Egyptian Dakotas ended bombing of Tel Aviv. That is only partially true. The REAF stopped sending bombers over Tel Aviv, but REAF Spitfires continued to bomb the city. Haus has an American bias when he calls the squadron that flew the S-199s the 101st Fighter Squadron. Israel used the squadron-naming conventions of the RAF and called the unit officially “No. 101 Squadron (Fighter)”. In use, this was shortened to 101 Squadron, pronounced “one-oh-one” – although some of the American volunteers did call it the “Hundred-First”. Also on p.74, Haus says only 24 of 25 S-199s were delivered. In fact, Israel took delivery of all 25 S-199s, but one was destroyed when the transport carrying the fuselage crashed in Israel. I could go on, but that should suffice to register my complaint. 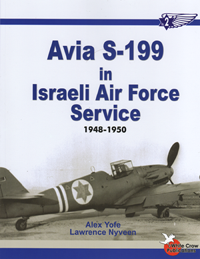 I have more accurate information at 101Squadron.com, and in my forthcoming book with Alex Yofe, “Avia S-199 in Israeli Air Force Service” (now in press). It is a shame that such misinformation continues to propagate. Is Timothy Cullen for real? Either this is exquisite comedy or it’s no wonder spec writers have to work so hard to be taken seriously. Oh my. I bet the editor *cringed* when he read this. But… I rather enjoyed it!